Mewlon 210: The original focal length of 2415mm and focal ratio of f/11.5 changes to 1961mm focal length and f/9.3 focal ratio. The image circle is now enlarged to 18mm and the field of view to using the reducer becomes 1.2 degrees. Mewlon 250: The original focal length of 3000mm focal length and focal ratio of f/12 changes to 2307mm focal length and f/9.2 focal ratio. 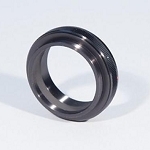 The image circle is increased to 42mm and delivers a 1 degree field of view. Mewlon 300: The original focal length of 3572mm changes to 2739mm and the focal length of f/11.9 changes to f/9.1. 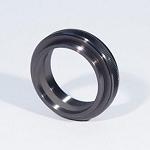 The image circle is enlarged from 25mm to 42mm and the the field of view becomes 45 arc minutes in diameter. What more could you ask for from an 8 ounce accessory? Well, the Takahashi TMC1800 Focal Reducer/ Flattener/ Corrector might be a light weight in some terminology, but it's a heavy weight in uses. 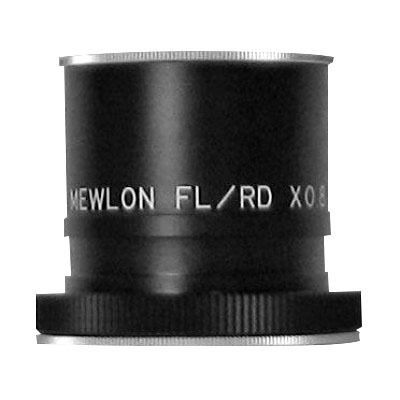 Just slip the 2" barrel inside the Mewlon focuser tube and you'll feel the safety groove which protects it from accidents. Not only does it work across three platforms by reducing focal ratio and length, but this kid really brings it on by performing as a field flattener and corrector. 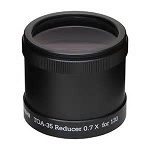 The Tak TMC1800 reducer has standard 42mm photographic T-threads for connection with your camera. However, the real feature is how the reducer puts the hurt on the coma which occurs naturally from the telescope design and swats away the field curvature that puts edge stars slightly out of focus. You'll be impressed at the way large astrophotos now have stars which have sharp characteristics displayed all the way to the edge of your "space"!